Essentially, this offers budding authors the chance to have a 10 minute one-to-one consultation with a top literary agent. Those people attending are required to send us a 1500 word extract of their work and a synopsis of their novel which the agents read beforehand so the agents can give feedback. So far, it's been a hugely positive thing for both the agents (who have discovered some great untapped talent) and also for the authors, who are getting the best possible feedback they can get. The evenings last for about 3 hours and in that time the agent will get to see around 15 people. Some of the agents we've had so far have included Cathryn Summerhayes from William Morris, Hellie Ogden and Jessie Butterill from Janklow & Nesbit Agency and Ella Khan and Bryony Woods from The DKW Literary Agency. These events have proved phenomenally successful and we'd like to make them a more regular thing in the Bookshop, perhaps hosting one a month with different agents getting involved. So, if you're a Literary Agent, specialising in any genre or type of book, please get in touch. You never know, you might discover the next literary superstar. Tickets £3 (includes refreshments) - BUY TICKETS HERE. Redeemable against any book purchase from Big Green Bookshop on the evening. This is the second of Peirene's "Coming of Age" series of events at the bookshop. This month we are delighted to welcome Hanne Ørstavik. Hanne is one of the most admired authors in Norwegian contemporary literature. She has published several acclaimed novel and has received many literary prizes, including the Dobloug prize for her entire literary output as well as the Brage prize, Norway's most prestigious award. Ørstavik’s novels have been translated into 18 languages but never, until now, into English. We will be celebrating the publication of her newly translated book, The Blue Room. It’s a novel about a mother-daughter relationship that will send a chill down your spine. Johanne is a young woman in her twenties who lives with her mother. When she falls in love with Ivar, she finally feels ready to leave home. The couple plan a trip to America. But the morning of her departure, Johanne wakes up to find the door locked. Can she overcome her fears? Will she shout for help? Will she climb out of her fourth floor window? This is a brilliant and important book. Hanne will be reading from and discussing the book and will answer any questions you may have. These are very special evenings and we urge you to come along. Tickets are just £3, redeemable on ANY book at the shop on the night. Early June sees the publication of Mount London, a very special book indeed. Did you know that an invisible mountain is rising above the streets of the capital - and, at over 1,400 metres, it is Britain's highest peak? This ingenious new book is an account of the ascent of Mount London by a hardened team of writers, poets and urban cartographers, each one scaling a smaller mountain within the city - from Crystal Palace (112m) to Primrose Hill (78m) - until the accumulative climb exceeds the height of Ben Nevis. The essays and stories in Mount London unpeel London's history, geography and psychogeography, reimagining the city as mountainous terrain and exploring what it's like to move through the urban landscape. Ascents of London's natural peaks are offset by expeditions to the artificial mountains of the city - the Shard (306m), the chimneys of Battersea Power Station (103m) - and the search for 'ghost hills' in the back streets of Whitechapel and Finsbury. With contributions by Helen Mort, Joe Dunthorne, Sarah Butler, Inua Ellams, Bradley Garrett and many more, Mount London is a unique and visionary record of the vertical city. You wil have a chance to meet Katy Evans-Bush, Gareth Rees and Tom Chivers, three of the contributors here on June 5th as they read from and discuss the book. Published by Penned in the Margins, a very exciting new publisher, and priced at just £10 (£12.99 usually), on the night, this is going to be a brilliant evening. Jasper Fforde - June 9th. An Evening with Jasper Fforde. We are thrilled to welcome bestselling author Jasper Fforde to the bookshop for a very special evening of book related fun. Jasper Fforde spent twenty years in the film business before debuting on the New York Times Bestseller list with 'The Eyre Affair' in 2001. Since then he has written another six novels featuring his Literary Detective heroine Thursday Next, the latest in the series, 'The Woman Who Died a Lot' published last year. Fforde's writing is an eclectic mix of genres, which might be described as a joyful blend of Comedy-SF-thriller-Crime-Satire. He freely admits that he fascinated not just by books themselves, but by the way we read and what we read, and his reinvigoration of tired genres have won him many enthusiastic supporters across the world. Amongst Fforde's output are police procedurals featuring nursery rhyme characters, a series for Young Adults about Magic and Dragons set in a shabby world of failing magical powers, and 'Shades of Grey' a post-apocalyptic dystopia set three world orders into the future, where social hierarchy is based on the colours you can see. Jasper’s only in London for a very short visit and it’s great he’s coming to the Bookshop. It should be a real treat. Tickets, priced just £3 are available HERE and Jasper’s books will be available on the night at a discounted price. This will sell out VERY quickly, so please make sure you buy tickets early. 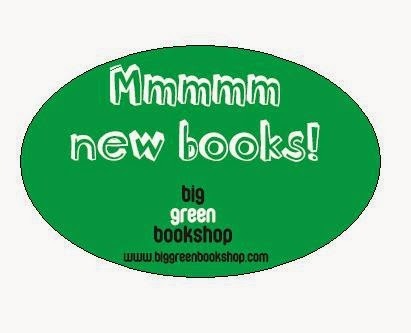 The Big Green Bookshop is delighted to introduce a new and easier way of buying books from us on Twitter. See someone post something about a book you're interested in on Twitter? 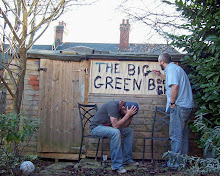 Simply tweet the details of the book with the hashtag #biggreenbookcart and this will automatically picked up by our dedicated team here at Big Green HQ. Postage is Free in the UK. We can take national book tokens online. You can talk to us if you need to. You'll get this sticker on your parcel. So, no more switching apps, typing passwords or trying to remember items you saw on Twitter. We've actually been selling books on Twitter for years, but thought this might make it a bit easier.